Literacy 9 Edition A leading resource for K-8 literacy programs, this extremely popular reading methods book has a simple goal: to provide aspiring teachers with the tools to help every student learn to read and write. 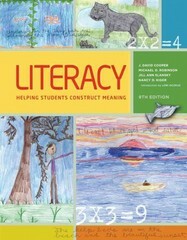 LITERACY: HELPING CHILDREN CONSTRUCT MEANING, 9th Edition, continues to provide pre-service and in-service teachers with the information, techniques, and strategies they need to assist their students in becoming literate. The book is distinguished in the field by its use of practical literacy lessons and authentic examples, which clearly demonstrate how to teach reading and writing. The Common Core State Standards are a major focus of this revision. In addition, new, full-color children's stories (in excerpts or in their entirety) model extended literacy lessons.